Send this Tier cake to your favorite’s one with choice of your flavor.The 4 Kg Two Tier Cake (without cooling) is one of our best cakes. This tempting and sinfully delicious cake is the highlight of any event. 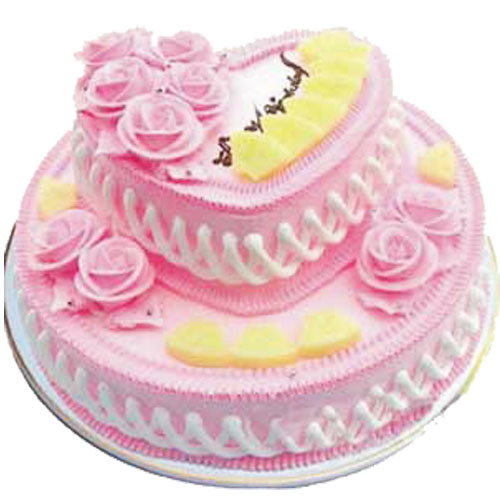 Place an order for our two tier cake to celebrate a party or send cake online to your loved one. Pamper the person you love the most with this cake on birthday, wedding, engagement, anniversary or any other important event. You can select from five tasty flavors; your options include pineapple, butterscotch, vanilla, strawberry and chocolate. Our swift home delivery service ensures that you get the cake on time; we also make special midnight delivery service.